It seems like homeownership is a common data filter in the social sciences. But nearly everyone I know who “owns a home” is paying a mortgage. How many “homeowners” have actually paid off their houses? Your question is an important one, not only because home ownership can have big consequences for the economy, but because 56 percent of all the housing units in America (that includes trailers, apartments and houses) are owned by the people who live in them. According to last year’s American Community Survey, one in three of those owner-occupied housing units doesn’t have any mortgage left to pay. You and I are talking about slightly different things here, though, John: You’re asking about homeowners and I’m providing data on owner-occupied housing units. That’s because the American Community Survey summarizes data about the country’s 132.8 million housing units, not the individuals who own them. If these different types of housing tend to have different numbers of people living in them (that seems pretty plausible to me) then these percentages about housing units don’t exactly translate to percentages about people. In other words, this data doesn’t show that 20 percent of Americans are homeowners who’ve paid off their mortgage debt, only that 20 percent of housing units are owner occupied with no mortgage left to pay. That the Census Bureau focuses on housing units rather than individuals is a curse and a blessing. It doesn’t disaggregate Americans who might be living with their parents, co-own a home, own multiple homes or live in rental accommodation despite owning a home of their own. But it also means we can get a great deal more detail about the value of those homes and how much the owners owe on them. So, if only one in three owner-occupied homes is mortgage-free, how far off are the other two in three? The median amount of outstanding debt on owner-occupied homes that still have a mortgage is $122,000 (that includes second mortgages and home equity loans where applicable). Another way of understanding that debt is by looking at it as a percentage of the property’s value — in fact, it’s the only other way we can understand it because the Census Bureau doesn’t publish data on what percentage of the original debt has already been paid off. Imagine you took out a $1 million mortgage in 2007 to buy a $2 million home in Malibu. Since then, you’ve paid off $900,000 of the mortgage (fist pump) but the value of the home has dropped to $100,000 (face palm). If you think about the percentage of your original million-dollar debt that you’ve paid off, you’re 90 percent done. But if you think about debt as a percentage of your home’s value, you’re 0 percent done. The census figures capture only the latter reality, which is still very relevant to your question, John. Some 5.1 million homes have the entire value of the property still to pay off. The stats actually say that they have “100 percent or more” to pay off, which is entirely possible if the home is now worth less than what is currently owed on the mortgage (i.e. the home is underwater). Mortgage debt (whatever its share of property value) can add up to some high monthly bills: Households with a mortgage shell out a median $1,436 per month in housing costs. That figure doesn’t mean much unless you understand it as a percentage of a household’s income. And for a long time, public officials have attempted to figure out what is an affordable percentage of income to spend on housing. In 1969, Edward Brooke, America’s first popularly elected black senator, pushed through an amendment to American housing law that set rent in public housing units at no more than 25 percent of the resident’s income. In 1981, Congress upped the terms of the Brooke Amendment to 30 percent of income, a number that (rightly or wrongly) has since become a widely held rule of thumb on affordability for landlords and lenders. And government statisticians. The American Community Survey also tracks the percentage of homes that are spending more than 30 percent of their income on housing costs. 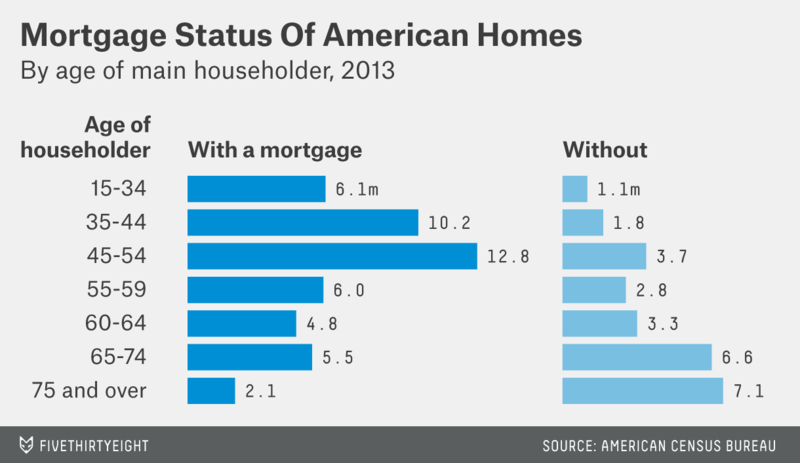 By that measure, 32 percent of households with a mortgage have an unaffordable one. There are clear regional differences though. Walker County, Texas, seems to be America’s most affordable county for wannabe homeowners with just 9.9 percent of mortgaged owners there spending 30 percent or more of their household income on monthly housing expenses (including, but not limited to, mortgage costs). At the other extreme, 54.9 percent of mortgaged owners in Kauai County, Hawaii, were spending 30 percent of more of their income on housing in 2013. Kings County in New York (better known as Brooklyn) has the second-highest share of people paying “unaffordable” costs. It’s worth noting that the 30 percent rule of thumb can also be applied to households in rental housing units — and as a group, they fare even worse than those with mortgage bills to pay. 52 percent of households that pay rent have monthly housing costs that are more than 30 percent of their income. There’s one other piece of data that can help us build up a clearer picture of American homeowners. The American Community Survey also has tracks the age of the main householder in owner-occupied homes. It shows (admittedly, unsurprisingly) that mortgage-free homes tend to have older principal householders than homes that still have mortgages left to pay. If you live in a home you own, I hope you’re one of the 32 percent that have paid off your mortgage. Given your age, though, that seems unlikely. Which is a shame because median housing costs are just $439 per month for mortgage-free housing units compared to $1,436 for those with a mortgage (although that still seems a heck of a lot better than paying the median $905 in rent with nothing to show for it).